Marcus-David Peters and his parents Jerry Peters, Sr. and Barbara Peters after his graduation from VCU in 2016. Essex County High School teacher Marcus-David Peters spent last Monday, May 14 in the classroom teaching biology to his teenage students. By day’s end, the 24-year-old would be dead, the victim of a fatal police-civilian confrontation along Interstate 94/65. Details are still forthcoming, as the Richmond Police Department (RPD) continues its investigation of the incident. RPD said Peters, who lived in Henrico County, was shot by the officer responding to bizarre behavior exhibited by Peters, who was naked and also unarmed. According to the police report, the officer fired his weapon when Peters charged at him after hitting three cars, leading police on a short pursuit, and dancing and rolling naked on the interstate. Peters’ mother, Barbara Peters said the behavior exhibited by her son was unexplainable. 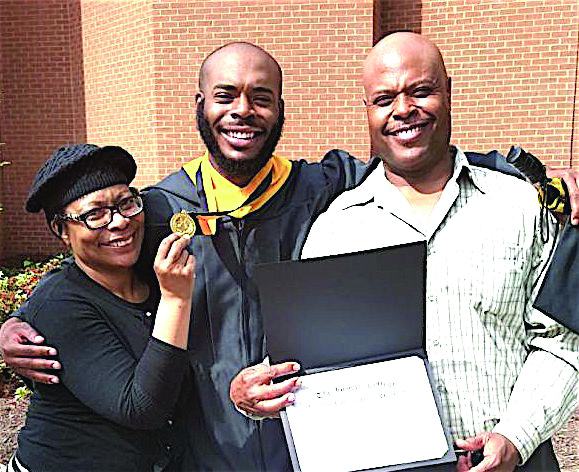 Peters had graduated with honors from Virginia Commonwealth University in 2016 and was a favorite among his students.